In this post we’ll cover the ins and outs of creating home ranges for animals based on point locations. This was mainly written as a tutorial for Ecology students but by all means, feel free to have a go. So here we can see isolpleths (contour lines) that contain 50 and 95% of all the locations. Splitting the home range into 50% and 95% contour lines is important to animal ecologists as it enables the researcher to see activity patterns. For example, within the 50% contour is where the animals was estimated to have spent 50% of its time during the period of interest. 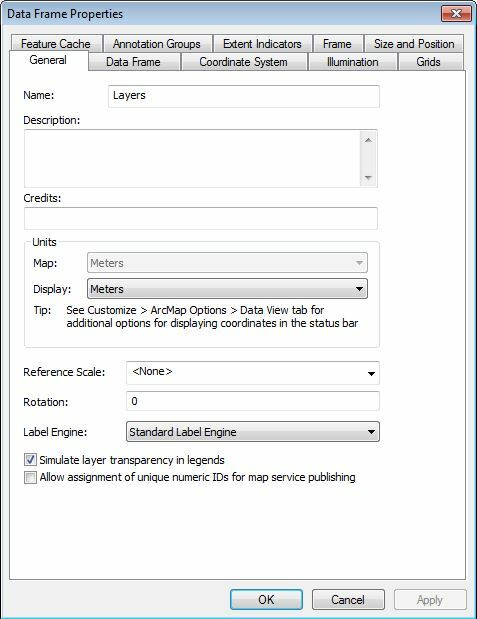 We can also see the Landcover Database underneath and also the attribute table from a spatial join that allows us to know how many points occurred in each of the landcovers within the 95% isopleth. Sweet, huh? In this post I’ll take you through how home ranges are derived and what you can then do with them. 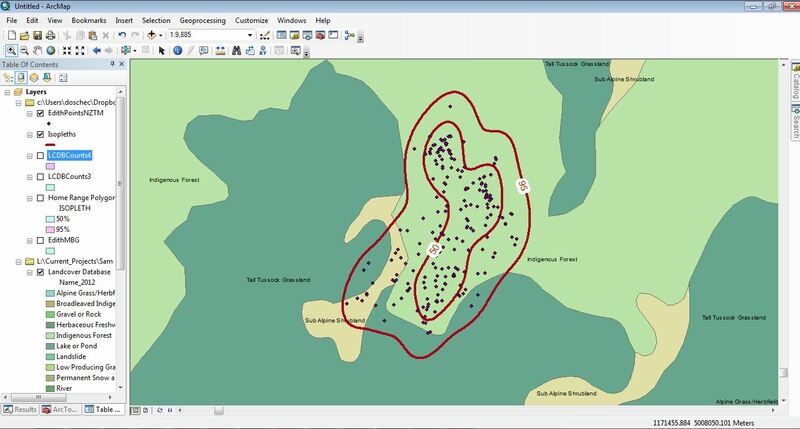 There are some built in tools in ArcGIS that allow us to derive some crude home ranges, but as we’ll see, to do it properly means going outside ArcGIS a bit and working with some other software. I’ll cover what you need and how to install the extra bits. (click here for a copy of this speadsheet. The first column is an identifier for the individual. 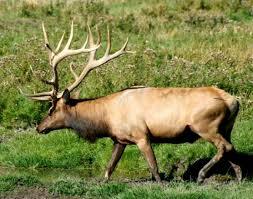 In this case, each record relates to the location of a Wapiti known as Edith. 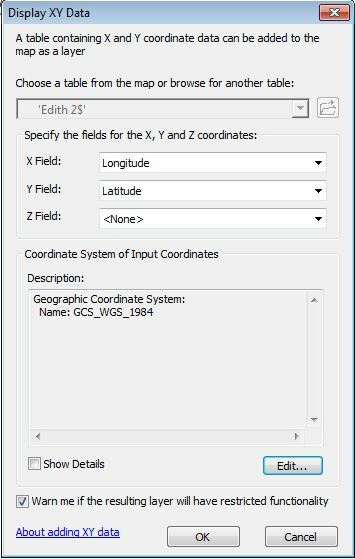 In order to map the points, right-click on the table name and go to “Display X Y Data…” and set it up with the field name for the x-coordinate (Longitude) and the field name for the y-coordinate (Latitude). We haven’t got a z-coordinate (elevation) in these data, but if we did we could also set that. She’s been busy. 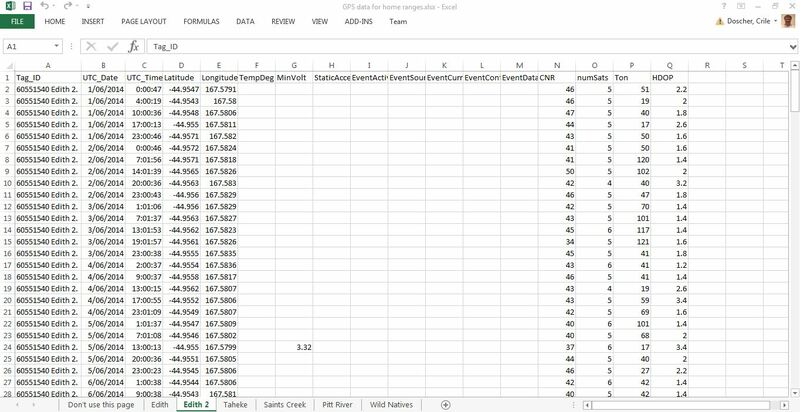 Note the points are in a new layer called “‘Edith 2$’ Events” An event layer is a temporary layer and to do any substantial analysis we should really save it as a permanent file. Even better, we should convert it (project it) from Latitude/Longitude (which is really a 3 dimensional coordinate system) to a 2D flat map projection, which will make area and distance measurements easier and more accurate. The standard projection for New Zealand is New Zealand Transverse Mercator (NZTM), a projection that was designed to play very nicely with GPS data. 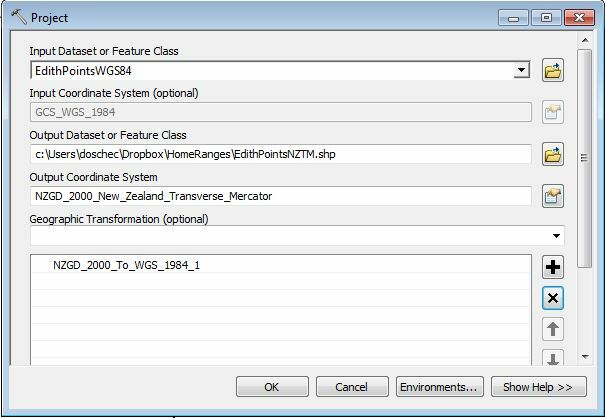 So we’ve got a two step process up next: export the events layer to a shapefile and then project that file from WGS84 to NZTM. 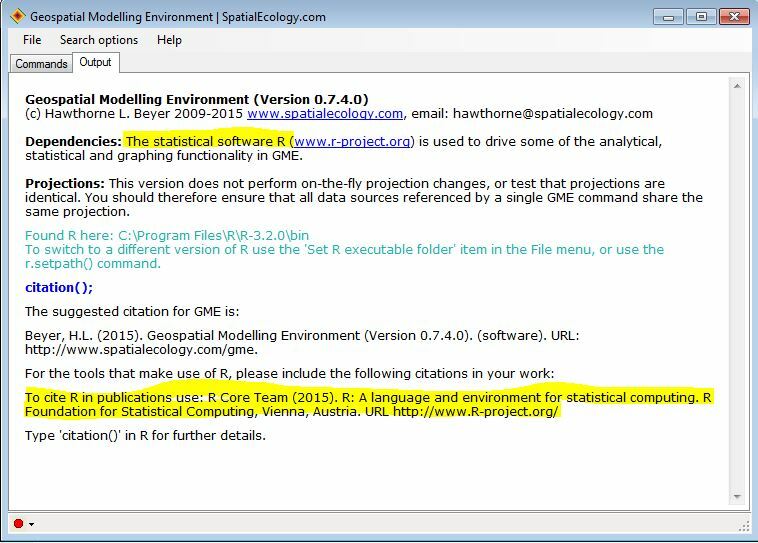 To project these points, open ArcToolbox and go to Data Management Tools > Projections and Transformation > Project (note that this tool only projects vector data; there’s a different tool to project rasters in the Raster folder). Once you’ve set the layer to project (EdithPointsWGS84.shp in this case) note that coordinate system gets automatically picked up from that layer. Give the new, projected layer a useful name. Here I’ve used EdithPointsNZTM.shp. The Output Coordinate system can be set by clicking the Edit button at right. The path is Projected Coordinate Systems > National Grids > New Zealand > NZGD2000 New Zealand Transverse Mercator about six pages down (note the dizzying array of NZ systems). The Geographic Transformation gets picked up automatically – in this case the default is fine. Click OK and a new layer gets created and added to your map. That’s useful, but from an animal ecologist’s point of view it’s not quite robust enough. The literature demands a different approach, that of kernel density estimations. It sounds a bit involved, but really it’s just a way to objectively measure how densely grouped a given set of points are. 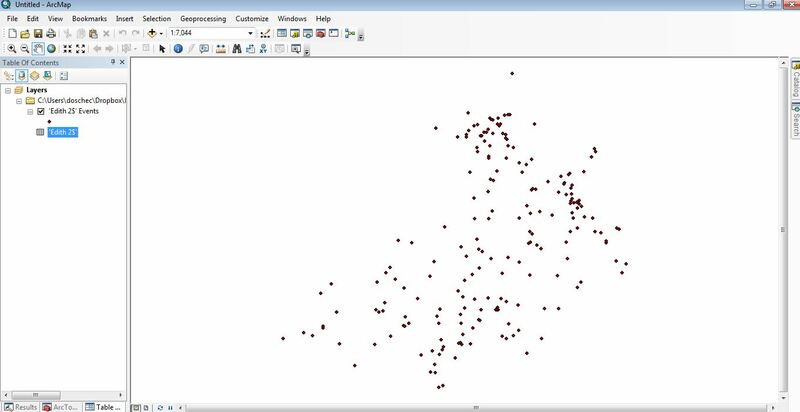 This is done by moving a fixed “neighbourhood” over each point (this is the kernel) and see how many other points are within that neighbourhood, thus allowing us to estimate the density. Conceptually, you’re fitting a smooth curve over each of the point locations and then adding up all where any of the curves overlap. The kernel is usually a 3 x 3 neighbourhood of grid cells. This is essentially a raster analysis – the output is a grid where each grid cell has a measure of density. The next step is to create contours (or isopleths) based on the grid values and use these to define the polygon home ranges. Animal ecologists are often particularly interested in the 95% and 50% isopleths, those contours that contain within them either 95% or 50% of all the points (the 95% isopleth is often used to define the home range while the 50% isopleth is the core range). So far, so straightforward (right?). So how do we do it? 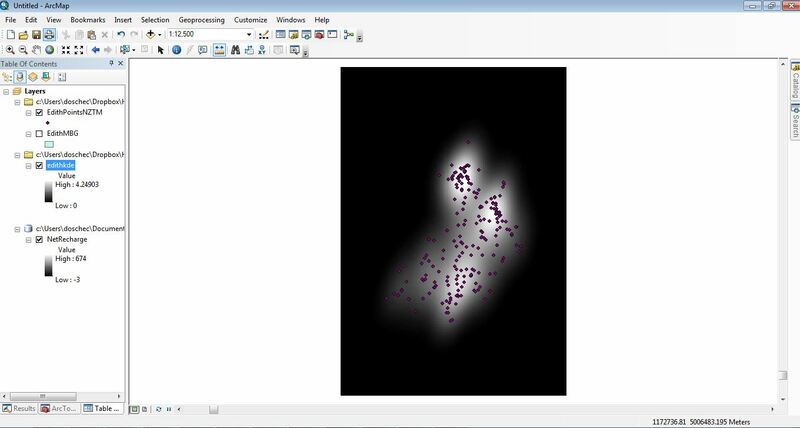 ArcGIS does have a kernel density estimator tool which works fine (ArcToolbox > Spatial Analyst Tools > Density). The issue really is isopleths. 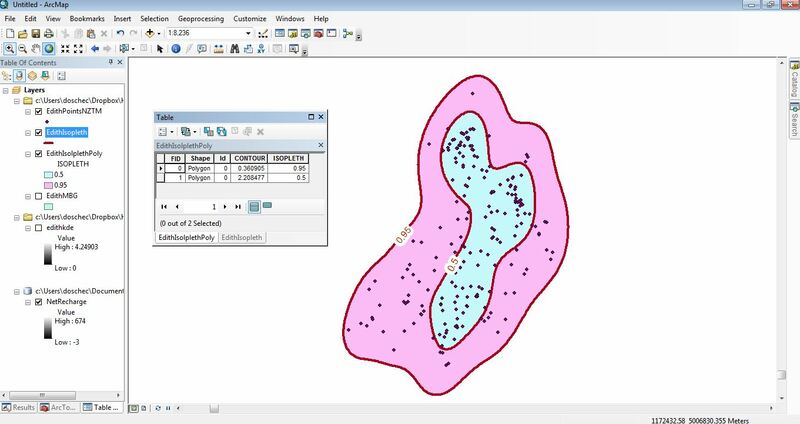 Determining the 95% points is not so straightforward but there is another option that allows us to do both in a reasonably easy way – the Geospatial Modelling Environment (GME). 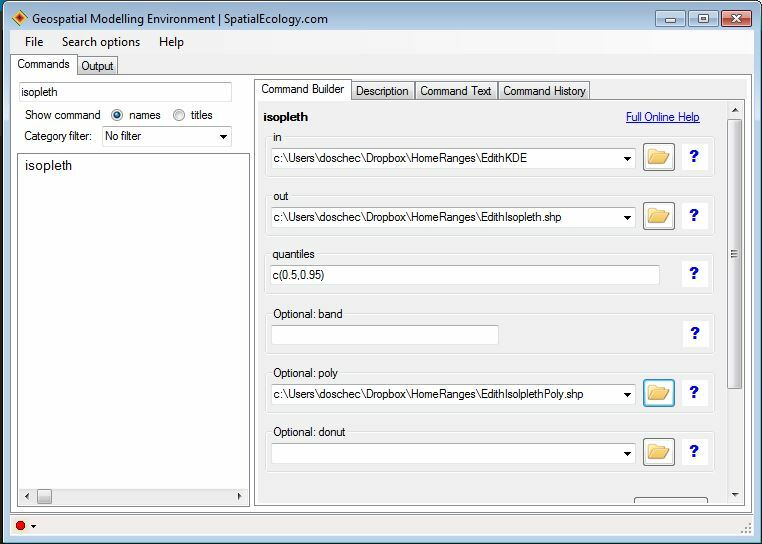 This is an independent bit of software that does all sorts of great spatial analysis (some similar to built in ArcGIS tools, but there are also more specialised tools that apply to specific disciplines). So before we do our home ranges we need to download and install GME. GME is a command line program which a huge array of tools built in. Some of those tools are actually using R, the open source statistical modelling tool set, so we’re also going to need to ensure that the correct version of R is also installed. 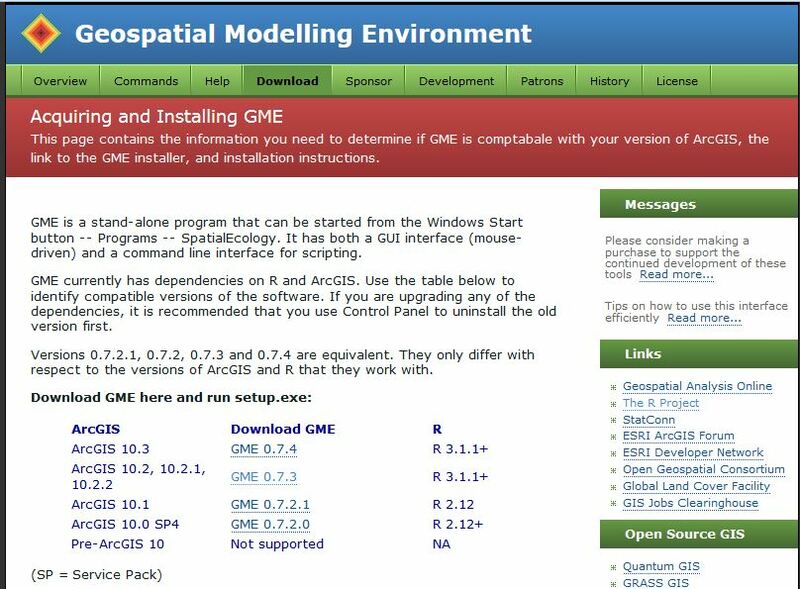 Going to the GME download page, you’ll see that there are various versions that run against ArcGIS. Most campus machines are running ArcGIS 10.3 so the version you would want to download is probably 0.7.4. (Check which version you have on your computer before downloading GME. ), plus the right version of R (I’m using the latest which is 3.2.0). Further down the page are installation instructions. What you end up downloading is a zip file that needs to be extracted somewhere. I’d try to put it somewhere safe and run the Setup.exe file. (If you’re trying this on an LU computer, you’ll probably need to contact ITS and request it to be installed). That’s all we should need to do in R once those new libraries are installed. You can now populate it with your parameters. 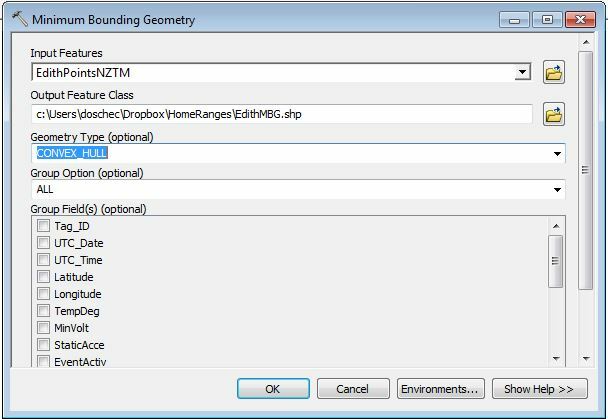 We’ll set EdithPointsNZTM.shp as the “in” file and save the “out” grid as EdithKDE. 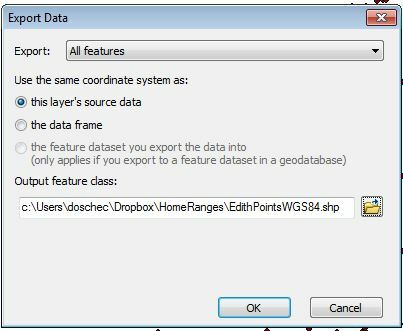 The bandwidth entry is an important one and one of the reasons why using GME is preferable (ArcGIS doesn’t have this option). There are several options but the one most favoured in the literature seems to be LSCV (Least Squares Cross Validation). (I don’t claim to understand how this works, but then I don’t understand what my dog thinks). 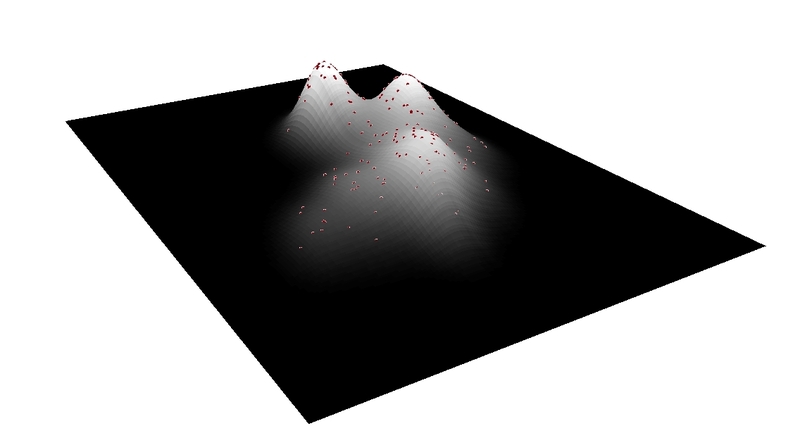 So you can (hopefully) see that the surface is higher where the points are denser. We’re not quite done yet. Next we need to derive our isopleths. 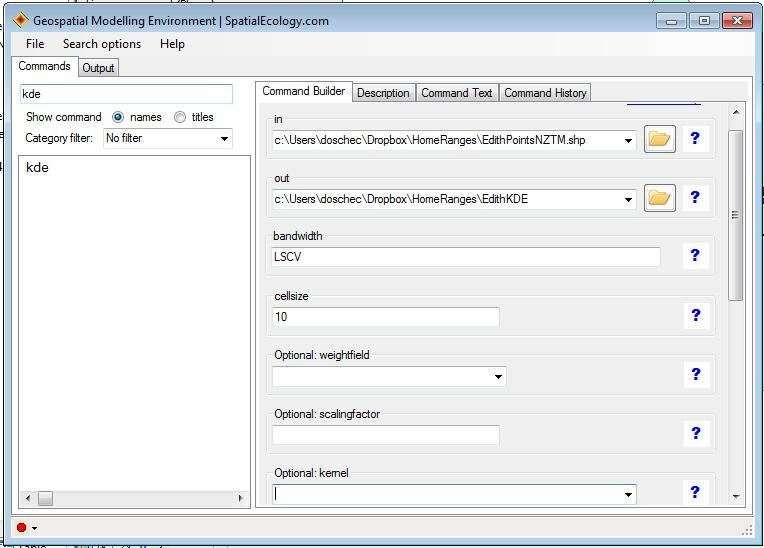 Back to GME and type “isopleth” in the command window. Key settings here are the input, output and Quantiles. With the Quantiles I can set which levels I want. ” c(0.5,0.95)” tells GME I was the 50% and 95% isopleths. If I leave this blank it will do the 100% isopleth. 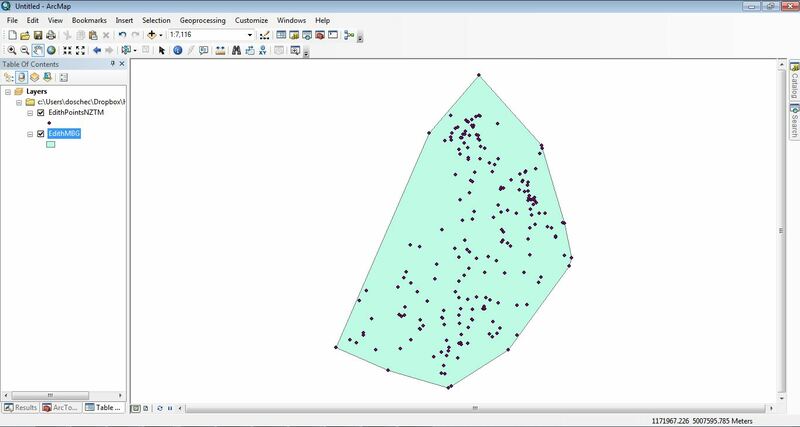 Also of note, I’ve specified a polygon output. Isopleth lines are good for display but having a polygon means I could use that clip out other layers or do some spatial analysis to see the distribution of stuff inside a given isopleth as we’ll see later. Here’s the output. Great, so now we can visually see which landcovers fall within the isopleths. If we want to be a bit more analytical then a good next step is to clip out the LCDB polygons within the isopleths. Here’s where the polygons come in handy – I can use one of the polygons to clip out what I need. I first went into the polygon attribute table and selected the record with 0.95 in the isopleth field. 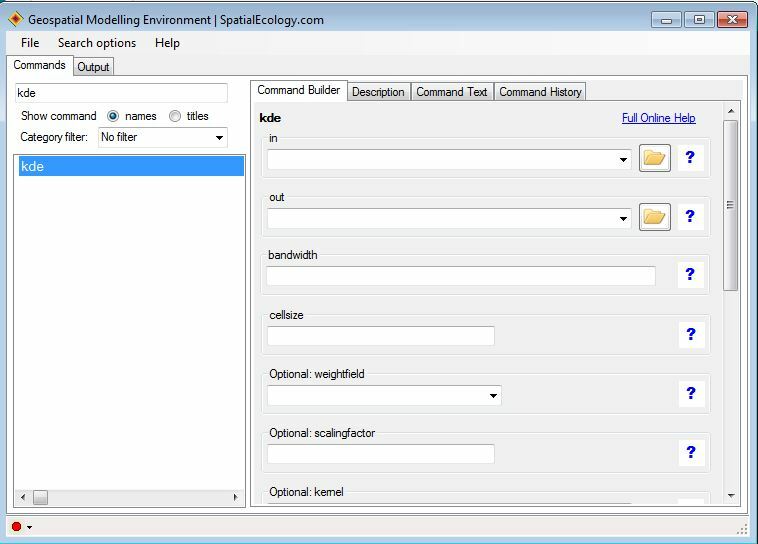 Then I used the Clip tool (ArcToolbox > Analysis > Extract or Geoprocessing menu > Clip). Here’s the output. We can see from this that, over the time these data were collected, Edith spent most of her time (181 of 202 records) hanging out in Indigenous Forest (can’t say that I blame her for that). So, we’ve covered a lot of ground here (excuse the pun). 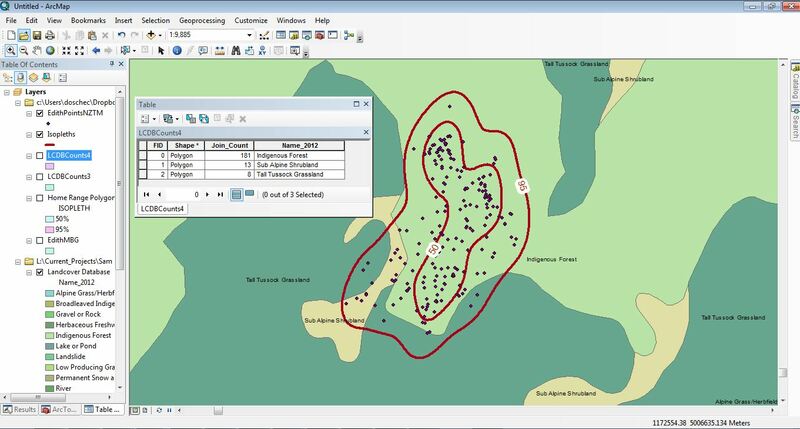 We’ve seen how to first map point data from a spreadsheet, then projected them from WGS84 to NZTM. We next got GME and R set up and used them to derive the 50% and 95% home ranges using kernel density estimation. 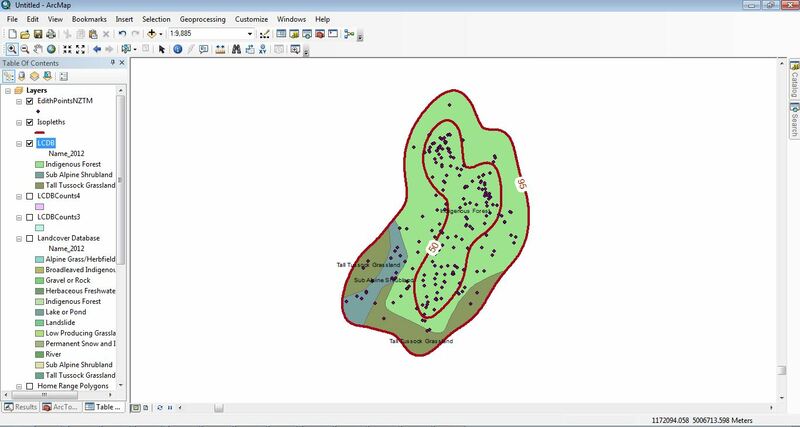 Then, a spatial join allowed us to summarise where Edith was spending her time.